About BIM Show Live - Barbour Product Search. 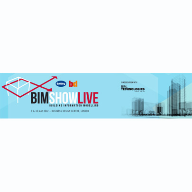 BIM Show Live is being held at Manchester Central, 8-9 April 2015. Whether youre a BIM Newbie or a BIM Master, everything you need to know about BIM can be found at BIM Show Live. With practical learning and insights from over 60 speakers, the Tech Hall packed with the latest solutions, and the very best in industry networking, this is the BIM event of the year. The unique conference programme is written by those using BIM every day, submitted through Call for Papers, and selected by an industry leading judging panel. Keep up with the latest BIM news.